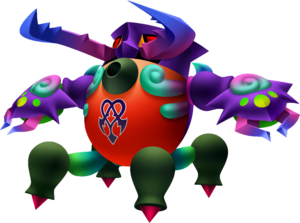 The Staggerceps is a Dream Eater that appears in Kingdom Hearts 3D: Dream Drop Distance. 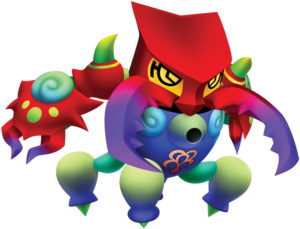 The Dream Eater's name combines the Japanese words for "scissors" (鋏, hasami?) and "stag beetle" (鍬形虫, kuwagatamushi?). ↑ 1.0 1.1 Becomes available when in Heavy Hitter disposition. ↑ 2.0 2.1 2.2 Becomes available after unlocking Secret: Green at D-5. ↑ 3.0 3.1 3.2 3.3 Becomes available after unlocking Secret: Green at E-4. Riku can obtain the Staggerceps Recipe from a chest at Backstage. The Staggerceps can be created through six different recipes. The fourth recipe is a rank D recipe that has a 40% chance of transforming from KO Kabuto.